Honestly there's a lot going on, and nothing major in need of improvement, but in the other hand there's just so much room for improvement that I think every element could use some love. Clarity in the required fields, improve the tap targets. 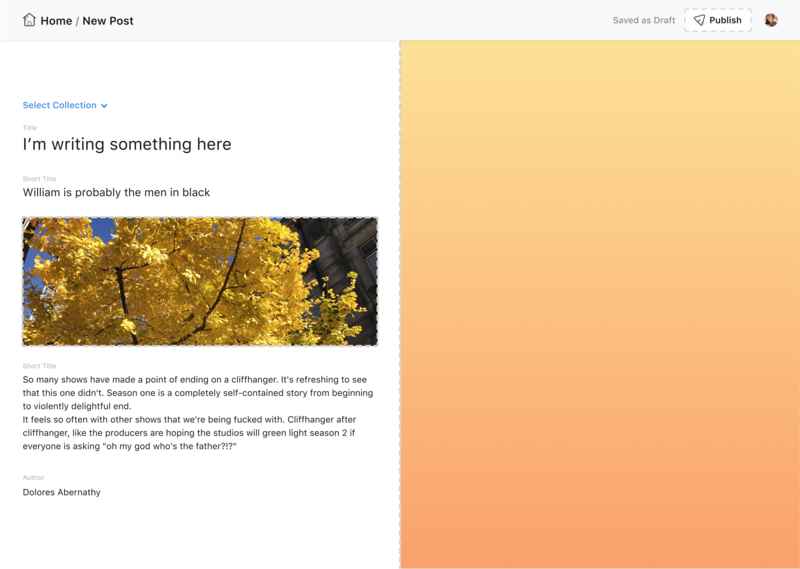 The big one, make the editor more enjoyable to use, allow the user to focus on the actual writing and remove distractions. Clean up the editor by moving some fields to a smaller drawer (see the bullet point above). When creating a new post, let's focus on the actual writing. Start writing. Let's keep the other metadata and required fields away until you need to fill them in. On one hand we want to provide a clean and distraction free environment, on the other we have half the view with a preview of something we can't really control. It could be flashing GIFs for all I know. 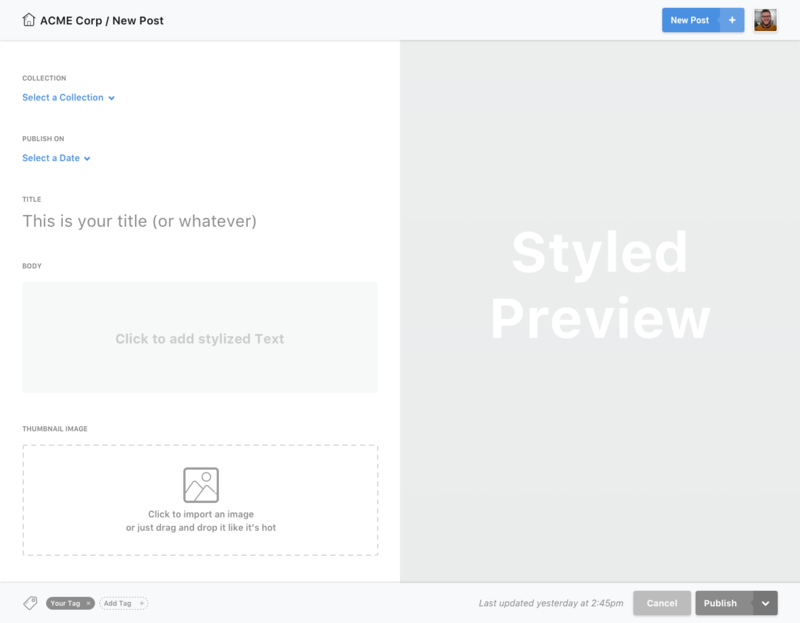 To alleviate this I think we should just change the opacity of the Preview to 65%, which can go back to 100% on hover. As you can see, there's a new drawer in the bottom. When you click on it it expands to reveal some other additional metadata that you might want to fill in. It can take up half of the screen when expanded, if there's more content we'll switch to a scroll area after that. 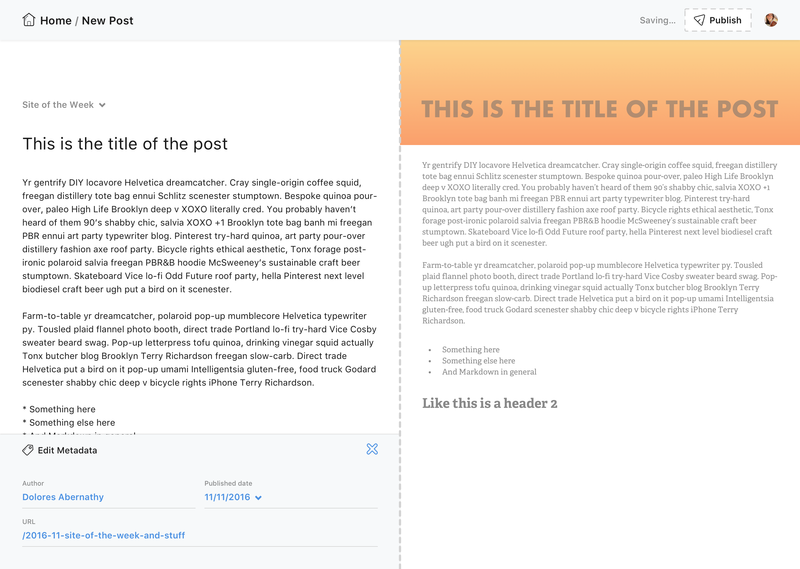 When the user hits the Publish button, the app should run some validation and prevent the post of being published if there's some required fields missing. Wow, this is amazing! So much cleaner, I really like it! There isn't "metadata". All a collection have is a bunch of "fields". There are no default or obligatory fields, which means a collection might not have a title or a body. To cope with this, the CMS has an "inference system" - a fancy name for a built in list of rules and synonyms used to try to guess the following fields: title, short title (or short description), author and content body. I think we should always display the name of the fields. We might infer them, but we can't just say "title" if the collection configuration defines "headline". 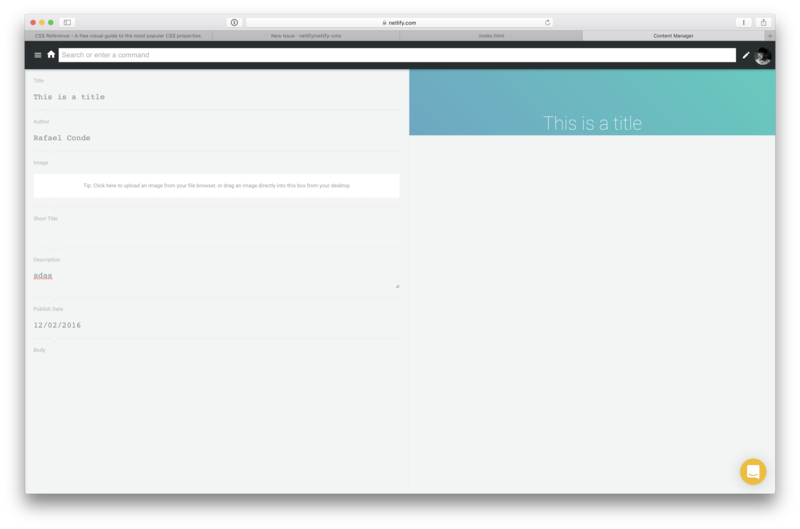 We also can't just display a text area for the content body"because the collection might not have one. Again, we don't have a distinction of what is metadata and what is not. So I love the idea of trying to separate and put the most important fields first (and we can infer them), but I don't think we should hide the other fields in a separated edit area (because they might be important for the content, not just metadata). We don't have auto-saving / save as draft. It's an awesome idea we could implement in the future, but right we don't have them. It's too minimalist. 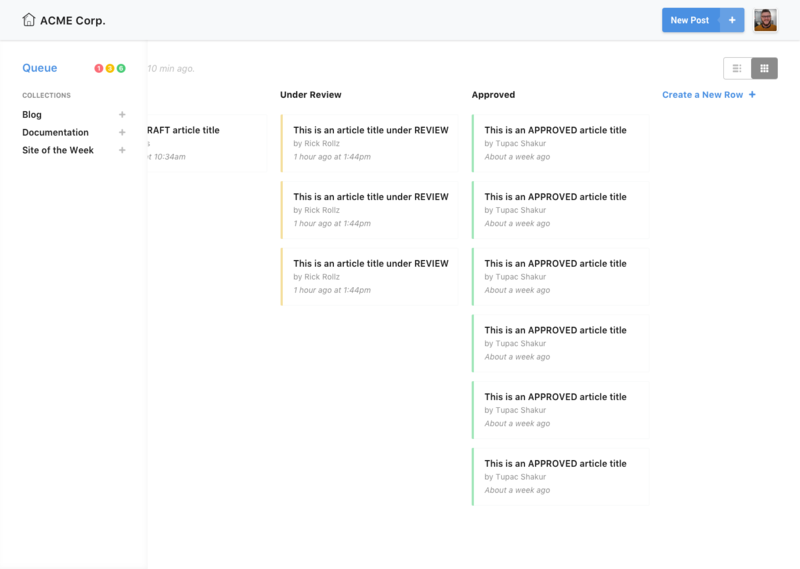 Remember at all times that we're not doing a Ghost or a blog editor, etc, but a CMS that will support lots of different content types with complex content models. It's really important that we design with this in mind. Plenty of collections won't have a main markdown body at all, and as @cassiozen mentioned, we might not have a "title" but instead a "headline" or "name" depending on the collection and the web project in question. Hiding the labels when a field is filled in is a no-go, there should always be a clear visible label for each piece of content for the same reason. We should have a clear way to indicate that an individual field is invalid after the validations have run. Also, given the Open Source nature of this project, I've decided to Open Source the Design as well. 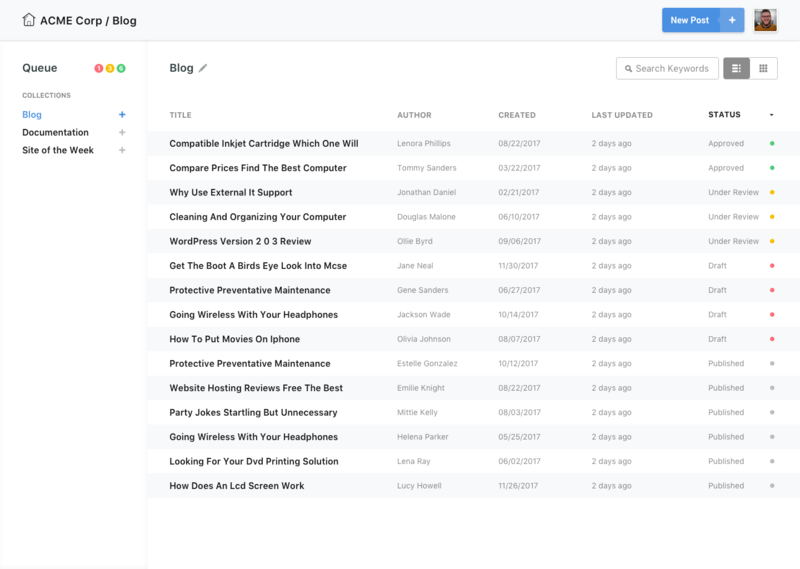 Is it possible where it says "new post" to instead use a word that is less specific (to blogs), like, perhaps, "item" or even something related to the collection? Great points @budparr - I agree with both. I think the "New " in the breadcrumb should simply be based on the label or name for the collection in the configuration so it's contextual. In the "New", like @biilmann said, is suppose to reflect the collection's name. Regarding item names, as in "New ___", I suggest adding a new property for collections, called something like singular_name. The existing name property represents the general collection title, e.g. 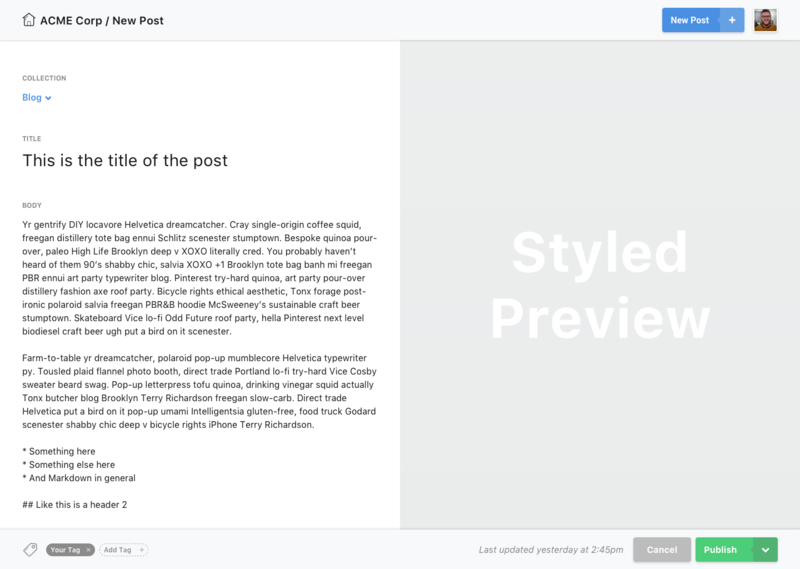 "Blog" or "Posts", and singular_name would be used in situations like "New post" or "Edit post". Omission of the singular_name property could default to the value of name. 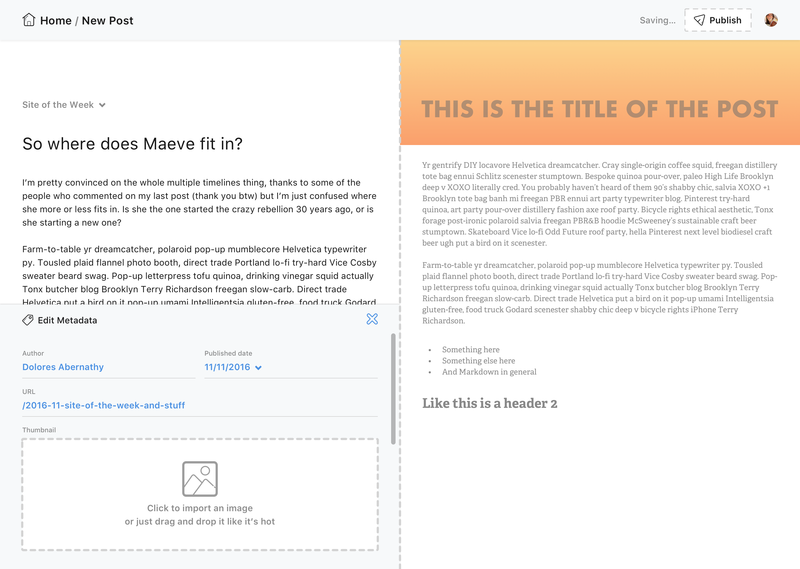 A similar property pairing is used in the configuration of WordPress custom post types. That's a good idea @verythorough. Additionally, we could also have a set of sane defaults hardcoded, because we already know that if the collection name is Posts or Blog you are going to create a New post. I don't think it'd be hard to maintain if we try to keep it as simple as possible. How would I know what section is coming up or which sections exist? I personally feel that a 'form' like setting is something editors are used to seeing and therefore more likely to be comfortable to use it. The fields don't look quite look 'clickable' to me either. Is the publish button there so it no longer has to follow that editorial workflow set up now (you can't publish unless you go to main page)? Is there a 'save for later' or another option or do we just expect people to exit out (totally get that it says 'saved' so that should indicate but just play a lil devil's advocate.). 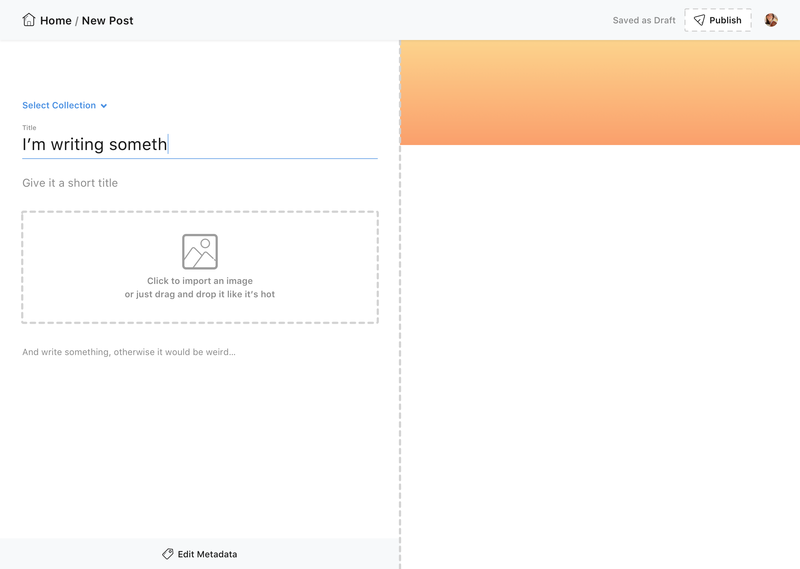 @rafaelconde I had some issues with figma so i exported to sketch and made my changes there. -Eli Sent from my iPhone. Kindly, pardon brevity and spelling. On Mar 24, 2017, at 11:23 PM, imorente ***@***. ***> wrote: @eliwilliamson this is beautiful! One thing to keep in mind is that it's hard to know what's going on without relying on color. Once "This is an APPROVED title"/"This is an article UNDER REVIEW"/etc. are replaced with the actual title of the content, there's no good way to know — You are receiving this because you were mentioned. Reply to this email directly, view it on GitHub, or mute the thread. @eliwilliamson I just want to reiterate what's already been said: the design work here is incredible! Glad to see all of the UX considerations coming in from contributors, too. This is going to be awesome. @indysigner it would be great if those were separated issues, otherwise they will be lost in this thread. 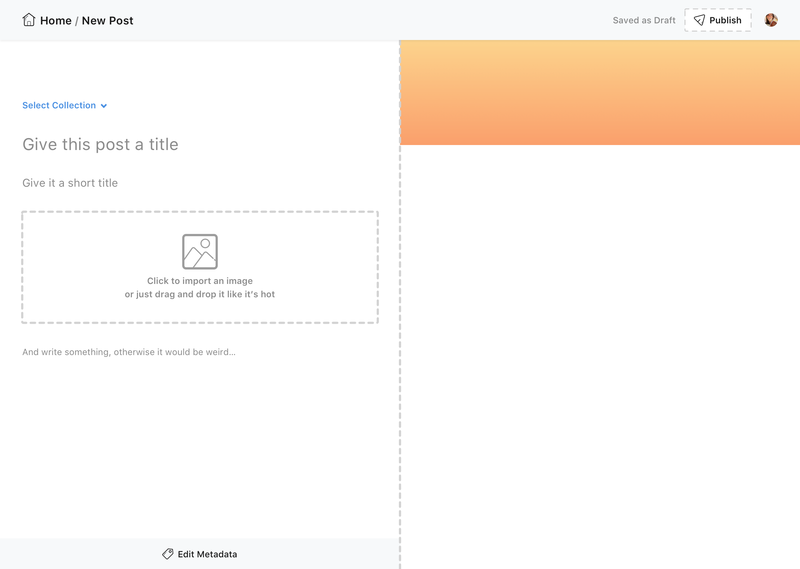 At the moment, this is "only" trying to find a better look and feel for what we have now, and hopefully put a small design system in place for new features. If we had those as issues, other contributors could jump of them as they feel, they can be very isolated as individual contributions. @indysigner Thanks! It's not really meant to be a full fledged page at this point, more a prototype of how different widgets could look and function. I'm planning on adding a bunch of extra ones just so we can explore different options. 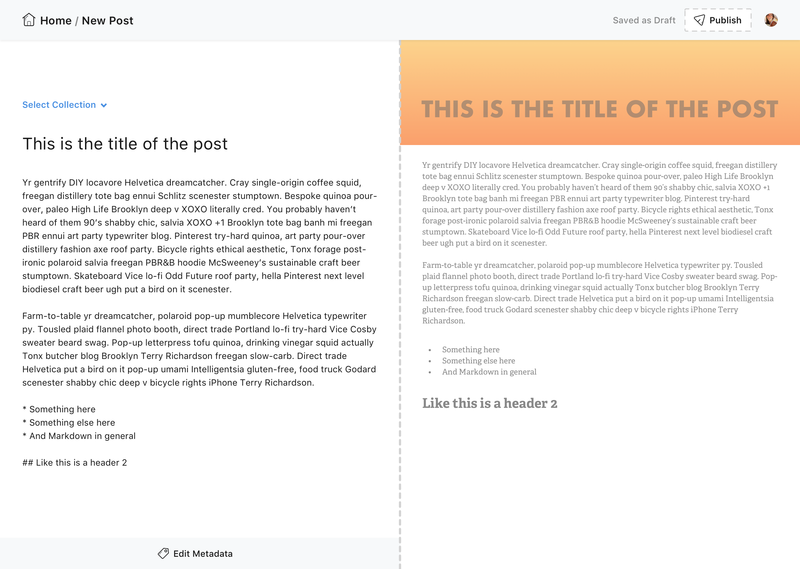 @danielpost, I love how nice and clean that design looks, while still being really functional (good contrast, labels and form controls are clear...). Can't wait to see more! The designs from @rafaelconde, @eliwilliamson, and @danielpost are all moving in a generally solid direction. Whatever we settle on aesthetically needs to be effectively communicative, accessible, cohesive, and scalable. As Mathias mentioned, this CMS has to cover use cases we can't even think of right now, so we'll want to avoid bending toward a particular kind of content. Because we'll soon be using Slate for the visual editor, we can easily offer a Paper-like experience by default (Markdown shortcuts, where the markers disappear) with the option to show the markers if desired. Slate has examples of both in the Markdown Shortcuts and Markdown Preview examples, respectively. All of that said, this should probably be handled under a different issue. 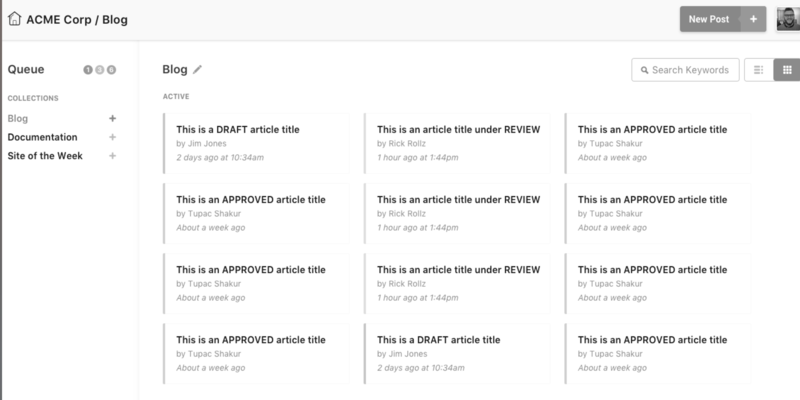 For now, it may be best to use a list for entries and search results, but retain the card UI for the editorial workflow. Dimming the preview - the preview can already be hidden, that should cover it for now. Metadata editing - yes, please. Especially for slugs. Copy professionalism - we should probably err to the side of boring. Clarity first. Omnipresent search bar - requirement. Media library - covered under #350. Comment moderation - covered under #314. Disable advertising checkbox - projects needing this can add a boolean widget field. Add edit URL field - we can edit the slug, but the URL is up to the build system. Bulk actions - out of scope, definitely nice to have. Separate issue would be great for this. API management - should be covered in the Config UI, see #341. Indicate multiple users editing - separate issue. Google Analytics integration - separate issue. There are many tools already developed (like https://github.com/sofish/pen, maybe not best example) which could be used. For wordpress users opensource tools like elementor are normal here and here (again, maybe not best example) so why not bring this also to netlifycms? Best regards. @kosirm the preview pane can be disabled trivially by either the user themselves or by disabling it for a collection in the config. Does that work for what you're looking for, or are you talking about something more involved? 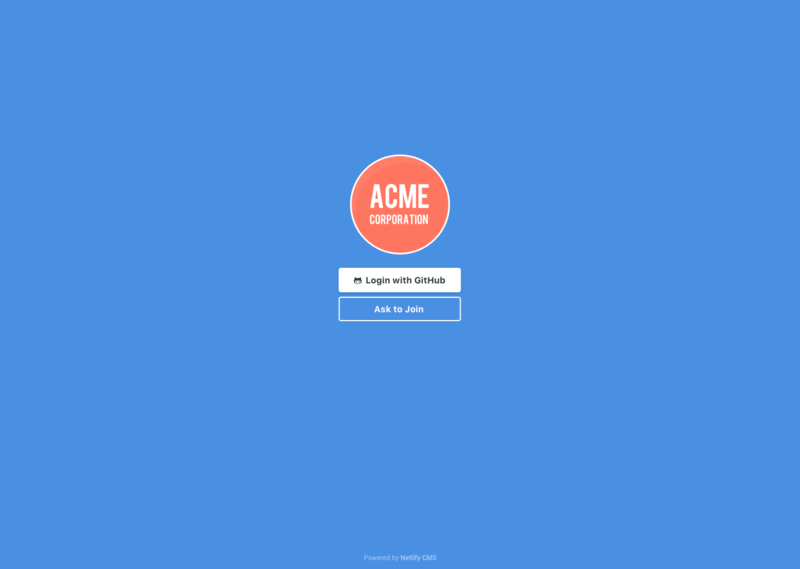 @andreasvirkus whatever frontend technology (mavo looks really nice project, thanks for link). 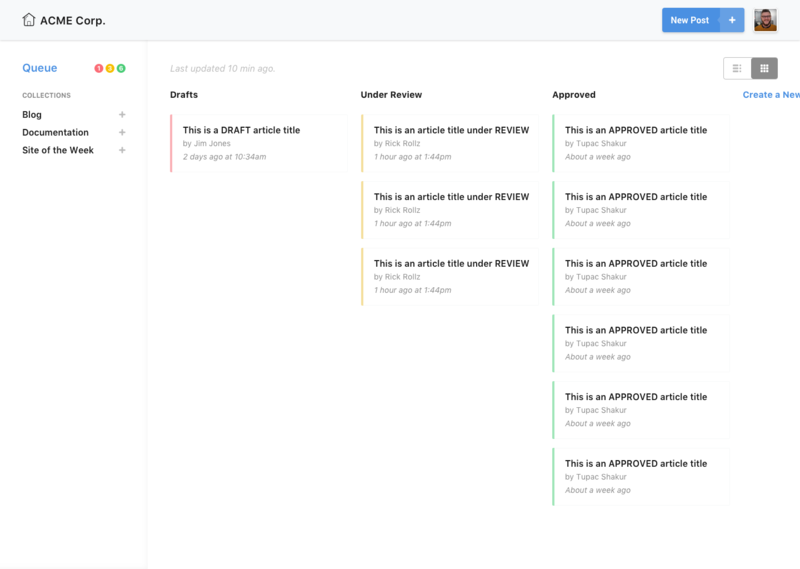 Idealy cms would cover multiple roles: designers, content editors, translators, etc. For some of them live editing is desirable, designers just need more broad access to structure and style (html dom) then content editors, but for translators probably best UX would be table view with text fields, etc. 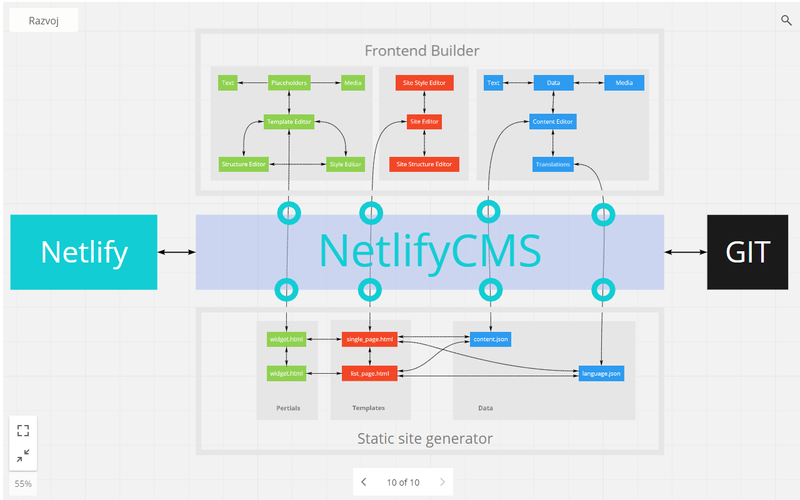 What I miss with netlifycms is really open architecture. Under warm "bateries included" feeling I hope to find replacable parts and not api with 4 methods. 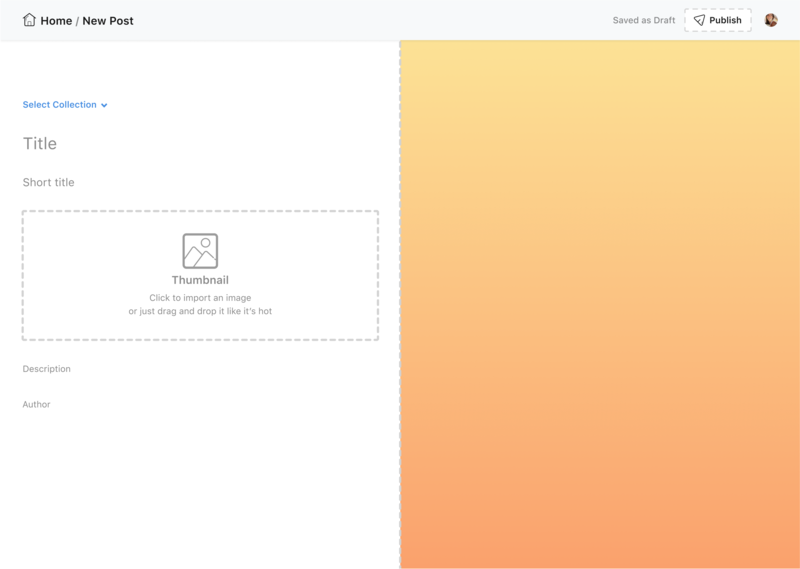 For example, I tried to implement this nice opensource template editor, but I was "short", not sure if because of my poor knowledge of react or because it is not possible at all... I invested some time to learn a bit hugo and react, which I never used before just to be capable to use netlifycms, because I really like it, it has great community and all... so to summarize, I hope netlifycms could be also front-end agnostic, not only back-end agnostic with strong and clear api in both directions. 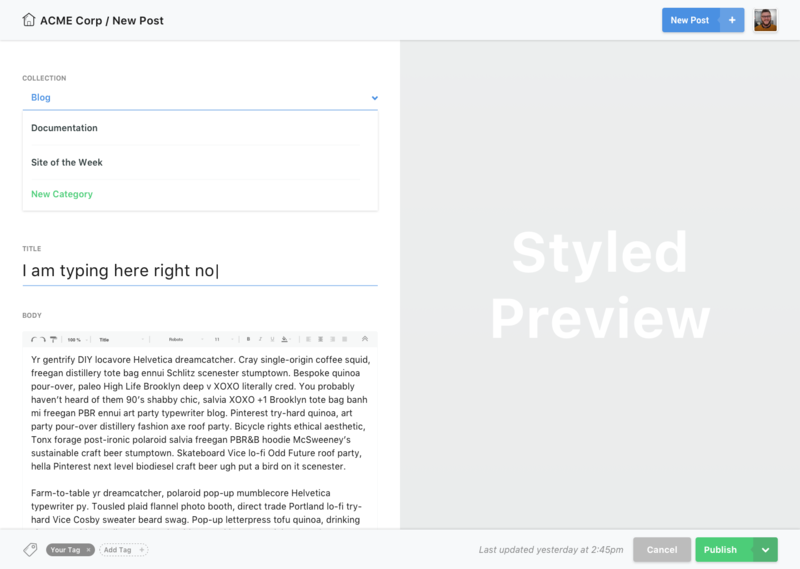 @kosirm I think the markdown editor that Netlify CMS already has is a core part of how the CMS works. One of the main differences that I see between the examples that you are providing (Mavo, CloudCannon, GrapeJS) is that they all edit HTML directly instead of Markdown. 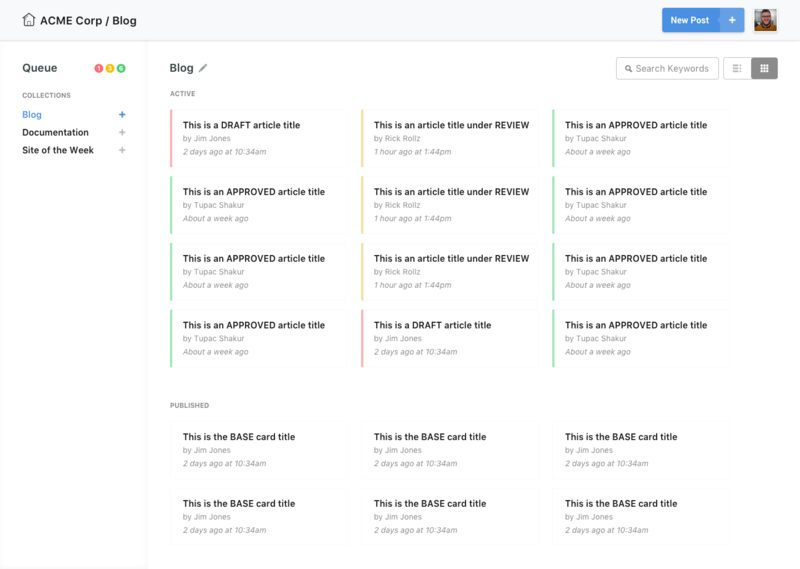 How are you thinking these would integrate with the CMS' markdown centric workflow? If you are thinking of it as a new feature, that would allow different front-ends to be hooked in, then maybe we should continue discussion in a separate issue. Maybe I'm just in the wrong place, sorry if this is so. @kosirm the CMS isn't meant to be used only with websites - the content that is created and edited in the CMS might be used in any number of non-website applications (mobile apps, for example). If you can give a concrete example of what kind of interface and end result you're expecting (the graph above is super high level), we can discuss more, but I'd ask that we move this conversation to our Gitter channel: https://gitter.im/netlify/netlifycms. The issue with live editing isn’t Markdown vs HTML - we aren’t really tied to markdown in any way except having a bunch of support for it. 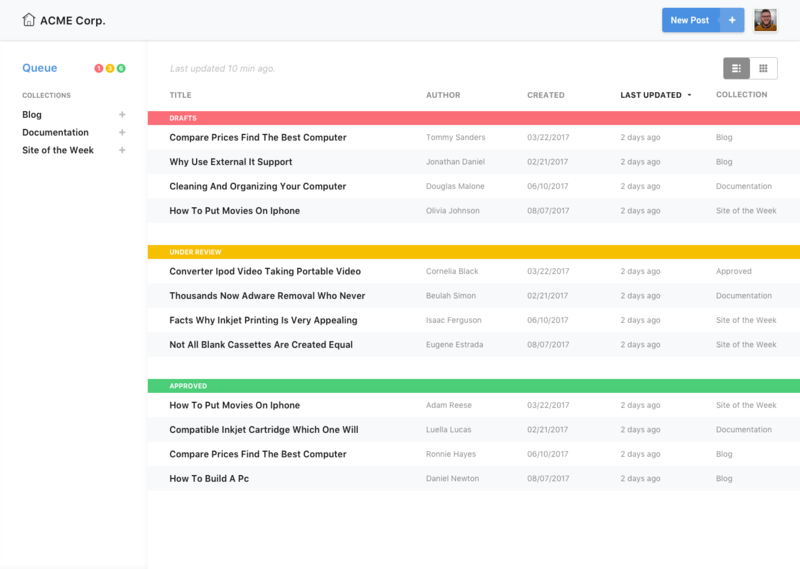 The issue with live-editing a site is that we have very little knowledge of or control over how the content we edit ends up in the final product. 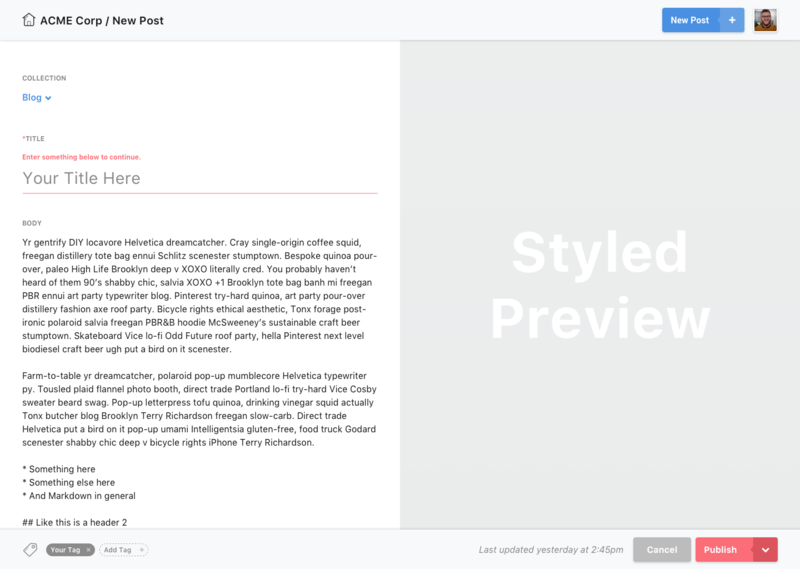 We try to sort-of-imitate the final site with the preview system, but it’s not exactly the same. We could definitely improve the UX of that, perhaps by bringing the control and preview panes together somehow, but it won’t be the edit-the-site-directly approach @kosirm seems to be looking for. As for that template editor, that may actually be feasible (depends on the architecture of that particular library). It just needs to be embeddable in a widget (so it needs to work inside React) and be able to serialize its data to text so we can save it. 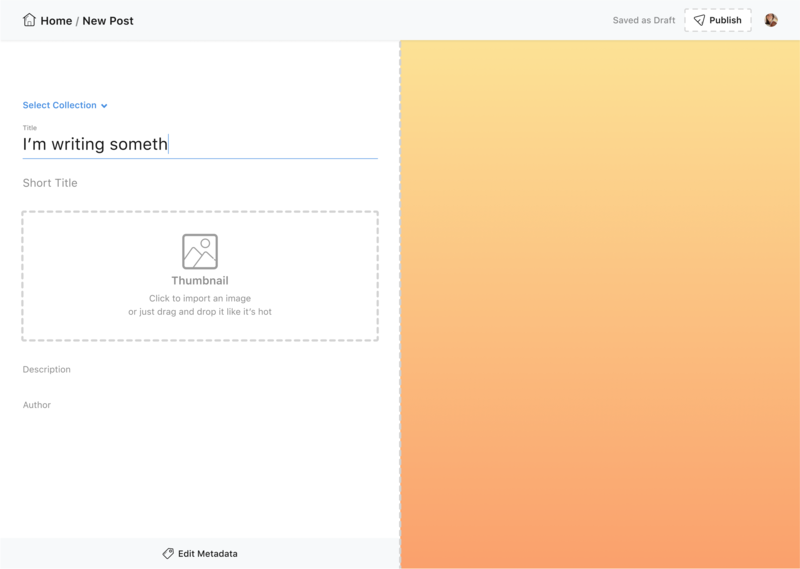 @kosirm The CMS is designed just to edit the content itself, it doesn't know what the final output or styling will be. A lot of this (original issue aim) was realized in 1.0. Closing.